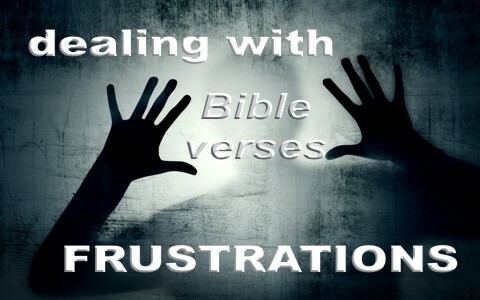 Here are my top seven Bible verses about dealing with frustrations in life. One man once asked D.L. Moody, who worked tirelessly day and night for God, if he was tired of the work to which Moody replied, “I’m tired in the work but I’m not tired of the work” acknowledging that laboring for the Lord is tiring but he never tired of doing work for the Lord. There is a difference and D.L. Moody marked it well. Fear is to courage what water is to fire. Fear can dampen or extinguish any good we might want to do and freezes us in its tracks. In some ways, fear is the opposite of trust so Isaiah writes that we have no need to be dismayed because God “will strengthen you” and more than that, He “will help you” and sustain you by upholding “you with [His] righteous right hand.” The right hand refers to a place of authority and strength so since God is for us, we have no need to fear because “If God is for us, who can be against us” (Rom 8:31). God was reminding Joshua and all of Israel, just after Moses’ passing, to be courageous and strong and not have any fear or be in dismay about what anyone can do to you. Why? It was because “your God is with you wherever you go.” If The LORD is on [your] side; [you need] not fear. What can man do to [you]” (Psalm 118:6). Fear and faith are like oil and water. They don’t mix very well. God is resistant to the proud of heart and will extend His grace only to those who are humble before Him (James 4:6). Why should we not be humble before God? God is supreme over all things and so we should be eager to submit ourselves “under the mighty hand of God” so that when the day comes (“at the proper time”) He will exalt us. The condition is if we humble ourselves, we cast all of our anxieties and frustrations on Him, because the fact is He cares for us. Only God can make the crooked paths straight. It takes the supernatural power of God to make straight that which is crooked but we must do this first; acknowledge God in all of our ways. That means giving God the glory for all we are able to do because He deserves all glory and credit for what we do. It is He Who can make the path safer by straightening it out for us. What a heavy load we try to carry around by ourselves. I know that I do but the fact is we were never meant to carry such loads. Jesus tells all who labor and become weighted down by the frustrations of life to come to Him. Only He can give us rest by taking the load off of our shoulders and placing it on His shoulders (yoke). A yoke is designed to spread out the weight so that one animal won’t have to carry the entire load. We can learn from Him because He is gentle and lowly in heart and desires for us to find our rest in Him. When you’re overloaded by the cares of the world, come to Jesus and give it all to Him. The Bible tells us that “The Lord will fight for you, and you have only to be silent” (Ex 14:14) but warns us “The Lord will send on you curses, confusion, and frustration in all that you undertake to do, until you are destroyed and perish quickly on account of the evil of your deeds, because you have forsaken me” (Deut 28:20). God “frustrates the devices of the crafty, so that their hands achieve no success” (Job 5:12) and He “brings the counsel of the nations to nothing; he frustrates the plans of the peoples” (Psalm 33:10) and “frustrates the signs of liars and makes fools of diviners, who turns wise men back and makes their knowledge foolish” (Isaiah 44:25). Take it all before God and place it in His mighty hands. Take a look at this related post: What Does the Bible Say About Anxiety? We cannot be reminded of this often enough. No matter how many times I read some verses, even putting them in to practice, I somehow eventually forget them! Which is why it is critical to constantly immerse ourselves in God’s Word. Whether by reading blogs like yours, or time spent in the Bible. However it happens, we can’t have these lessons often enough! My brother, you are always a joy to read as your comments has specificity in them and you always humble yourself by how receptive you are. I truly am thanking God for you Jim. You have stated that mine is encouragement. You certainly have the gift of teaching! We are meant to work together for God’s glory. Amen…only for His glory for nothing else matters! Jack- thank you for these words of God’s encouragement. Always helps to be reminded of His power and faithfulness. I have read and re read these verses and clung to them. I am having issues with believing them, and depression for what all is going on. I have been up and down spiritually and even mad at God. I have seen him work and know he is there but this has been almost two years and I am in a slump I know in my heart and truly believe but feel like there is no light at the end of the tunnel. How do I get back from this I feel almost dead inside? I have requested prayer a long time ago and you and Doc both were praying I also have many others praying, any advice? How about talking with your pastor, turning in a prayer request as “unspoken needs” to have the saints praying for you and maybe even fasting (start slowly and consult doctor if you have preexisting medical issues). I know these verses are great but try spending time in Romans 8 and John 6-11? You must believe what God’s Word says over how you feel because human emotions and feelings are the most unreliable of all things in us. Trust God, not your feelings. I have had one year now of a debilitating illness which is not going to get better without God’s intervention. It has been very interesting. Let me encourage you through my experience. Sometimes the pain, both physical(for me and others) and emotional (for all of us) becomes a weight of heaviness upon our minds(souls). So much so that it is hard to think of anything else. The pain, emotional and/or physical becomes all consuming because we cannot get away from it. In medical terms we call it intractable. We have to take it with us wherever we go. I then had a number of close family members die suddenly and many other close associates and friends quit my employ or retire. I have had 15 such losses this year as I counted them up the other day. After I had that pity party for myself I felt quite badly and was wondering quite a bit about the year 2015. I did not think about blaming God because we know that is a non-starter. “If I ascend to heaven, You are there; If I make my bed in Sheol, behold, You are there.” Ps 139:8. There is no place or nothing that God does not know about. He knows your pain and mine. He knows your thoughts and mine. In other words I have always known where to run when times get tough. It is not away but towards God. I have always called it the “paradoxical bind”. How can we possibly run away from the ONLY source of our ultimate good and help? That is Jesus. He cares for us. He is intimately concerned about us and–this is key– He orders every one of our steps. Do not read that lightly. Jesus will order your every action and move as you follow Him. So much for my pity party! Now I will confess I take time-outs to feel sorry for myself from time to time because I have not figured out how to not be human yet…;-) But let me tell you what I have learned. How do I use this brokenness in body to follow Him? After we are born again, or saved His Spirit dwells within us. That is of first importance. Then we attempt with His help to lead holy lives. We turn away from those things that He is telling us that displease Him. This is repentance…turning from sin and turning towards Christ. This is a daily act of obedience in following Him. Ok, now we are born again and are trying to please Him daily. Then how do we overcome and become conquerors? This deserves a drum-roll…we “ASK HIM TO DIRECT OUR STEPS MOMENT BY MOMENT”. C’mon Doc, that is too simple. No, it is profound, and I have just rediscovered it this year through all these seemingly “terrible” things that have happened to me. I mean this is really revolutionary Joni! If we really live our lives with the expectancy that today, “I am giving my life to you Jesus. Use me for bringing about your Kingdom. May Your Kingdom come today in my life…may Your Will be done, right here on earth, as I seek to get that parking space, as I help my mom with Alzheimer’s, as I visit my son in prison. Order my day that all the little details will work so that Your Kingdom will be established here, right now, as it is established in heaven”. We have to believe and act on the knowledge that God has allowed these things to occur in our lives that they will accomplish His Will as we ask Him to use us to bring about His Kingdom. I know that sounds crazy but its not! How can my loved one dying slowly of cancer accomplish His Will. It does as we “ASK HIM” to use that experience to accomplish His Will for our lives and more importantly…His Kingdom. The Word says very specifically that the steps of a good man/woman are ORDERED by the Lord(Ps 37:23). We are the “good” people because we have the “Good One” within us as we are saved. The Word also says very specifically that man makes His plans but the final outcome is in God’s Hands(Pr 19:21). The prison guard cannot defeat us. Mom’s Alzheimer’s cannot defeat us, because as we “ASK HIM” to order our steps. THERE IS NOTHING THAT WILL HAPPEN IN YOUR LIFE THAT WILL VARY FROM HIS PROMISE AND WILL”. What promise? The promise we have been discussing that God will order your steps and all things(even though they sometimes are very difficult to bear) will be ordered by God and they will be for our ultimate good because they will accomplish His Will. I hope this helps Joni. It is a lame attempt to share what God has been helping me understand this past year. So continue to trust Jesus. Read His Word everyday. Read a proverb every day(read the one that corresponds to the date of the month today). God will speak to you. Then “ASK HIM” to order your steps today and then “look” for the hand of God moving events around you to help usher in His Kingdom. It will blow you away!! I love God and work hard to obey- or when im feeling afraid or havung a hard time obeying, i ask HIM to help me become able and willing to obey. Ive tried to be so understanding and accepting of trialsxand Ive recently took a leap of faith and the results have been very mixed. I guess I can see goid in some ~ but some have been excruciating and totally disorienting and lonely and painful and disappointing and I question if the choice He urged me to make was really so right because it really doesnt seem so right. I try to be obedient and take comfort in your article, which a friend sent, but Im hurt reading them because God sounds little l Iike the loving Gid i thought He was and instead harsh, cruel, deliberately hurtful, uncaring and that He plans to burden and test and wiegh me down with misery for my whole life. I dont understand. I have a long background of trauma and abuse, already, emotional, physical and sexual and have wirked on believing that God does love me and to trust Him and have had 20 years of therapy and believing He qill turn it into good for others. I havent given up even when i felt like i wanted to diecthan live another day. Ive faced truth even when it was painful and I didnt like it. I believe all too well that Im vastly uncomprehending of Gods wisdom and I have a humble heart and I try to serve others and be mindful of everything I say and do. I work in social services, volunteer with 3 organizations, go to church, go to Christan counseling and am joining small groups. I add that last part so you understand my background experiences and that Im already working earnestly to do the things it seems God calls me to do. I also pray frequently, humbly and from the bottom of my heart, being honest with Him, myself and others. I wonder if you have some insight on this whole matter and why God sounds to be so unfeeling and mean when I continue to try so hard. Hello Mimi. I am so sorry for all your pain that you have gone through and are still going through. God never wastes suffering and I know that God often uses people greatly who have suffered deeply. Jesus said that road to eternal life would be narrow, and difficult and we have to strive to enter into the narrow gate, and few there be that find it, so don’t give up. God never forsakes you or leaves you (Heb 13:5), even if it feels like it, which brings up a point. What if Jesus said, “I don’t feel like going to the cross. I didn’t do anything. I am innocent, and it’s not fair,” but Jesus came to choose to give His life as a ransom for us (Mark 10:45), and thankfully, He didn’t rely on what he felt but what He knew He had to do to save us. Don’t trust your feelings as much and keep serving, and loving, and giving. You don’t have treasures here…but in the world to come. God never promises happiness to us…and never promises there will be no sorrow. I will pray for you Mimi. I can see you don’t really want to quit. It shows me your faith is strong. so good to see a page like this, i could afford to do with prayer. although i have already shared with someone very close. who is my spiritual mother. Pastor Jack, small note concerning your article above: in your conclusion you give reference to the verse that begins “The LORD himself will send on you curses, confusion, and frustration…” as Eccl. 28:20 but there are only 12 chapters in Eccl. It’s actually Deut. 28:20 but had a hard time finding it. just thot I’d give you a heads up for future readers that may wanna look this passage up….. Thank You! Hello Jake and a big thank you sir for the Scripture reference being in Deut instead of Eccl. Nice catch. I corrected it, and there’s yet more evidence that only the Word of God perfect.